- Purchased end-table, we love it... elm top over black-stained legs. 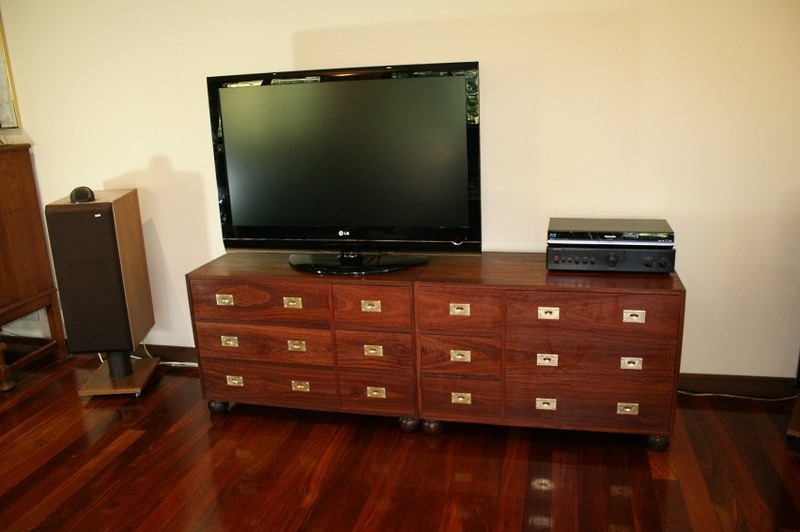 - TV stand which I made in 2008 with walnut and black MDF. Pretty happy with it. - The "stereo cabinet" which we don't like very much now. - A "CD shelf system" which will probably go away too. Where the stereo cabinet is, something fairly tall would be nice to fill the space. Probably 5 ft. tall -- or somewhat more. I have seen the Christopher Schwarz "Oak Aumbry" piece and I really like it, but it's not contemporary enough for this room. I have seen pictures of many Krenov cabinets, and there is much to like, but something with black structure and natural-wood highlights (instead of extensive natural wood) would fit in here better. I don't really fancy curved legs; I would like a more rectilinear version. Pine cupboards (chimney cupboards?) look pretty nice, but again for this room a yellow wood or a knotty room isn't a great fit. I do have a homemade pine cabinet in another room that goes nicely there, though. Most of my lumber is 48" or less in length, so a style using those shorter piece lengths while still being fairly tall in composition would be a bonus. Maybe a version of this? made to fit into a spot beside a chimney....called a stepback cupboard..
My advice: Think about all the things you would like to store in the finished piece and build something that will do that job. Get an rough outline of the size and shape, play around with that, make drawings, make changes and one day you will know that you have arrived at what you want to build. It's a fun process. One thing is for certain though. Whichever method you use, you can be absolutely certain that you are most assuredly doing it wrong. I am not sure if this is your style. We prefer to keep things uncluttered, quite minimalistic. If it were me, I'd build a simple floor-to-ceiling unit to fill the entire space between the two pilasters where the TV and the stereo cabinet now reside. It would combine book shelves with custom space for the TV, stereo and anything else you might think of (artwork, sculpture, vases or other 3D artwork, for examples). 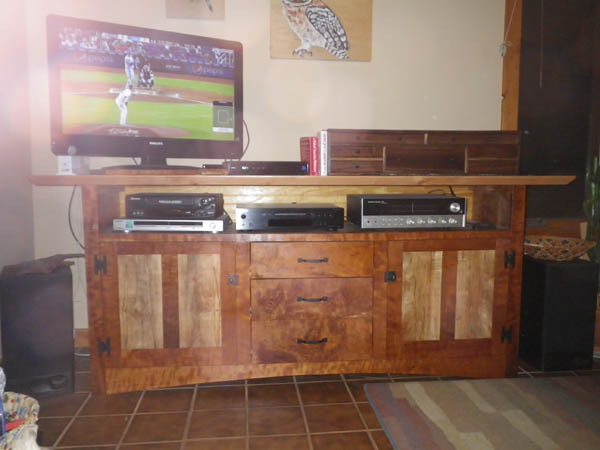 The custom spaces for the TV and stereo would provide shelving/enclosures for the components and hide the wiring. It would be a clean, uncluttered way to house your entertainment systems with your library and art collection. First thing I'd do is get the TV mounted on the wall and then design cabinet/shelving to go underneath it between the two columns. You all have some very nice-looking projects! Quote: You all have some very nice-looking projects! In my line of work your room design is called lining up birds for the carnival duck shoot. Converting everything to drawers, cabinets, and shelves is one way, but it can get busy looking and don't ever ask me to dust the stinker. The TV stand needs to disappear too. Happy with the TV base? Keep it. It will define what you do for the rest; it already is, per your spec.'s. I'm guessing you put in those two pilasters to break up the blank wall. Keep them and you will need to design and build around them. I keep wanting double up the new stuff to flank the TV between the pilasters. That leaves the globe table odd man out. Another thing you can do is go into the wallpapering business. Personally, for that space I want something like what Rob Lee built and did a humorous build-along (on this forum?). A long, low, Danish style wall cabinet. Simple, simple, simple. The attachment simply shows the form to give an idea. I think it is about 7 feet long. I would go up to 9 feet. Those legs are a bit too high-water in my thinking. Current time: 04-18-2019, 07:12 AM Powered By MyBB, © 2002-2019 MyBB Group.